The dentigerous cyst is the most common developmental odontogenic cyst of the jaws. The dentigerous cyst is the most common developmental odontogenic cyst the jaws and accounts for 20% to 24% of all epirthelium-lined jaw cysts. It is defined in the literature as a cyst surrounding the unerupted tooth’s crown and adhered to its cervical region. This diagnosis should not be based only on radiographic evidence. Instead, it should include macroscopic and microscopic examination of the specimen, since various other lesions-such as unicystic ameloblastoma, odontogenic keratocysts, and central giant granuloma-may also occur in this position. Dr. Sannomiya is professor in Dentomaxillofacial Radiology, Dentomaxillofacial Department of Oral and Maxillofacial Radiology, São Paulo Methodist University, São Paulo, Brazil, and professor of the Post Graduation Program in Orthodontics, São Paulo Methodist University; São Paulo, Brazil; Dr. Nogueira is an orthodontist and Dr. Diniz is a periodontist, both at the São Paulo Dental Association, (APCD); Dr. Pacca is professor or Oral Stomatology, Department of Stomatology, Santo Amaro University (UNISA), São Paulo; and Dr. Dalben is pediatric dentist in orofacial clefts and a a student in oral pathology, Department of Pediatric Dentstry and Community Dentistry, Hospital for Rehabilitation of Craniofacial Anomalies, University of São Paulo, Bauru, Brazil. The pathogenesis of dentigerous cyst is still controversial. Some authors have suggested a developmental origin affecting mature teeth usually secondary to tooth impaction. In this case, it would be initiated by accumulation of fluid within the reduced enamel or between the reduced epithelium and enamel. An inflammatory nature has also been suggested, which would affect immature teeth as a result of inflammation (eg, from a nonvital deciduous tooth), spreading to the region of the tooth follicle. Most patients diagnosed with dentigerous cyst are younger than 20 years old; the percentage of 6- to 7-year-old patients with dentigerous cysts in only 9%. Associating this finding with tooth trauma would be even less frequent, according to Counts et al, who reported a case of an angressive dentigerous cyst in a 7-year-old child. Due to the small number of cases at this age range and scarce reports of association with trauma, the purpose of this article was to report the case of a dentigerous cyst involving the permanent central incisor’s tooth bud of a 5-year-old child who had a history of trauma to the maxillary region. A 5-year, 9 month-old boy presented at the Pediatric Dental Clinic of São Paulo Methodist University, São Paulo, Brazil, for initial screening. Before this, the mother had taken the child to a private dental practitioner. The professionals at São Paulo Methodist University attempted to contact this practittioner, yet he had moved to an unknown address. During anamnesis, the mother reported that the child had suffered severe trauma to the face at age 4 years, with bleeding and lip wounds, followed by edema without need of suture. The mother did not mobility of any deciduous teeth after the trauma nor did she report any occurrence of alveolar fracture. One year later, they came to the pediatric dental clinic due to appearance of bucal swelling with cortical thinning, with sensitivity of the left anterior teeth (Figure1). Panoramic and periapical radiographs were then obtained, revealing significant root resorption of the primary maxillary left central and lateral incisors with lingual displacement left of the incisors and canine. There was also superior and distal displacement of the permanent maxillary left central and lateral incisors and canine. The radiolucency was diffused, with ill-defined borders. Except for one focal area in the midline, there was no evidence of sclerotic margin (Figure 2). Based on these clinical and radiographic characteristics, differential diagnosis included the hypotheses of dentigerous cyst, central giant cell granuloma or central hemangioma. Figure 1. Intraoral aspect with mild buccal swelling. Figure 2a and 2b. Initial panoramic and periapical radiographs demostrating well-defined radiolucent area with radiopaque borders surrounding the permanent maxillary left central incisor and displacement of tooth buds of the permanent maxillary left lateral incisor and canine. The patient was then referred to a maxillofacial surgeon. A buccal intrasulcular incision was performed from the deciduous maxillary rigth lateral incisor to the deciduous maxillary left firt molar and two releasing incisions were made from the distal papillae of these teeth to the buccal sulcus. The attached gingiva and alveolar mucosa were thoroughly dissected to allow good surgical access. The swollen region exhibited a very thin cortical plate, allowing aspiration of the cyst, which revealed a yellowish liquid characteristic of cystic content. Enucleation was then performed by fabrication of a window access on the bucal bone plate. The deciduous maxillary left lateral incisor was also extracted at this time. During resection, it was noticed that the permanent maxillary left central incisor was part of the cyst. Thus, its removal was necessary (Figure 3). The surgical site was completely curetted for removal of all cystic epithelial remnants and to induce bleeding in the area for new bone formation and healing. The flap was repositioned and sutured with Vicryl 4-0. Figure 3. Removed cyst with tooth bud of the maxillary left central incisor-macroscopic view. Macroscopic examination revealed that the cyst measured 2.5×2.0x1.8 cm and contained a tooth structure in its interior measuring 1.2×0.8 cm and another on its wall measuring 0.8×0.6 cm. Microscopic examination revealed tooth fragments embedded in a cystic structure lined by nonkeratinized squamous epithelium without atypical figures. The histological examination also revealed the presence of moderate inflammatory infiltrate with lymphocytes and plasma cells and capillary proliferation, which led to a final diagnosis of dentigerous cyst (Figure 4). Figure 4. Cystic structure lined by nonkeratinized squamous epithelium without atypical figures-microscopic view, hematoxylin-eosin staining, original magnification X10. Postsurgical follow-up was performed after 8 months. The panoramic radiograph obtained on August 2006 revealed partial repositioning of the maxillary left lateral incisor’s tooth bud. The maxillary left canine’s tooth bud is still located above the tooth buds of the maxillary left first and second premolars (Figure 5). Figure 5. Follow-up panoramic radiograph after 8 months, demonstrating partial repositioning of the maxillary left lateral incisor and canine. The exact histogenesis of dentigerous cysts is unknown. Development of a dentigerous cyst, howerer, requires the presence of an unerupted tooth. Regarding its pathogenesis, Al-Talabani and Smith suggested that they may have an extrafollicular or intrafollicular origin, and that the latter may occur by fluid accumulation between the reduced enamel epithelium or within the enamel organ. It has also been suggested that the permanent tooth’s crown may erupt in a periapical cyst related to the respective deciduous tooth. This phenomenon probably occurs, although not often, because periapical cysts are not common in the deciduous dentition. In the present case, there was a history of trauma to the deciduous maxillary central incisor. At that time, no diagnosis was made regarding impaction of the permanent maxillary central incisor. Kubota et al reported that trauma to deciduous teeth can lead to disturbances in the odontogenesis of the respective permanent teeth. Such disturbances may usually give rise to hypoplastic defects or crown/ root disruption in the permanent teeth, or even deviations from the normal eruption pathway. This type of dentigerous cyst usually promotes bone expansion, but rarely causes cortical destruction. The growth potential of this cysts is apparently limited, but it can cause sufficient bone expansion to promote facial asymmetry, as in the present case. Many dentigerous cysts reach great dimensions before being diagnosed. Displacement of impacted teeth to another region, such as the mandibular border, is relatively common. Movement of adjacent teeth or root resorption may also occur. In the present case, the permanent maxillary left lateral incisor’s tooth bud was severely displaced to the region of the maxillary left first and second premolars, and the tooth bud of the permanent maxillary left canine was displaced close to the maxillary sinus above the tooth bud of the permanent maxillary left lateral incisor. There was also root resorption of the deciduous maxillary left lateral incisor. Even though the dentigerous cyst is the most frequent jaw cyst in the first decade of life, its frequency is lower in the 3 following decades. According to Shear, dentigerous cysts are primarily related to premolars and molars and rarely affect the incisors and the age range reported in the present case. Selection of the proper surgical technique depends on the dimension of the osteolytic region and its relationship with anatomical structures observed radiographically. 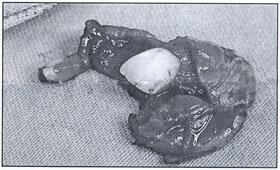 Enucleation is the technique of choice for small cysts. In the present case, it was possible to enucleate the entire lesion, despite the extensive bone destruction. Another surgical option would be marsupialization, usually recommended for larger cysts, which can promote decompression and lesion redduction. In the present case, complete enucleation was preferred due to the need for differential diagnosis with odontogenic keratocyst and the interrupted root development of the central incisor. This type of cyst may be detected by routine radiographic examination. Patients with dentigerous cysts should be submitted to thorough radiographic examination combined with histopathological examination to allow selection of the proper treatment plan. Treatment planning from now on comprises extraction of the deciduous molars at a later age to facilitate the eruption of premolars. Also, extraction of one premolar will probably be necessary for achievement of space to the maxillary left lateral incisor and canine. 1. Shear M. Inflammation in dental cysts. Oral Surg 1964;17:756-67. 2. Farman GA, Nortjé CJ, Wood RE. Cysts of the jaws. In: Oral and Maxillofacial Diagnostic Imaging. 1st ed. Sr. Louis, Mo: Mosby Co; 1993:212-6. 3. Benn A, Altini M. Dentigerous cyst of inflammatory origin: A clinicopathologic study. Oral Surg Oral Med Oral Pathol Oral Radiol Endod 1996;81:203-9. 4. Lustig JP, Schwartz D, Shapira A. Odontogenic cysts related to pulpotomized deciduous molars. Oral Surg Oral Med Oral Pathol Oral Radiol Endod 1999;87:499-503. 5. Takagi S, Koyama S. Guided eruption of an impacted second premolar associated with a dentigerous cyst in the maxillary sinus of a 6-year-old child. J Oral Maxillofac Surg 1998;56:237-84. 6. Counts AL, Kochis LA, Buschman J, Savant TD. 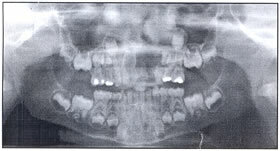 An aggressive dentigerous cyst in seven-year-old child. 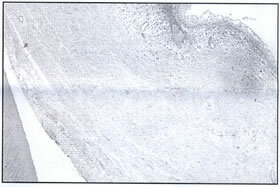 J Dent Child 2001;87:499-503. 7. Al-Talabani N, Smith CJ. Experimental dentigerous cysts and enamel hypoplasia: Their possible significance in explaining the pathogenesis of human dentigerous cysts. J Oral Pathol 1980;9:82-91. 8. Kawamura JY, Magalhães RP,Souza SC, Magalhães MH. Management of a large dentigerous cyst occurring in a 6-year-old boy. J Clin Pediatr Dent 2004;28:355-7. 9. Shibata Y, Asaumi J, Yanagi, Y, Kawai N, Hisatomi M, Matsuzaki H, Konouchi H, Nagatsuka H, et al. Radiographic examination of dentigerous cysts in the transitional dentition. Dentomaxillofac Radiol 2004;33:17-20. 10. Kubota Y, Yamashiro T, Oka S, Ninomiya T, Shirasuna K. Relation between size of odontogenic jaw cysts and the pressure of fluid within Br J Oral Maxillofac Surg 2004;42:391-5. 11. Homem MGN, Simoes WA, Zindel D, Chilvarquer I, Aparecida TA. Dentigerous cyst associated with an upper permanent central incisor: Case report and literature review. J Clin Pediatr Dent 2002;26:187-92. 12. Bodner L. Cystic lesions of the jaws in children. Int J Pediatr Otorhinolaryngol 2002;62:25-9. 13. Singh S, Singh M, Chhabra N, Nagar Y. Dentigerous cyst: A case report. J Indian Soc Pedod Prev Dent 2001;19:123-6. 14. Motamedi MH, Talesh KT. Management of extensive dentigerous cysts. Br Dent J 2005;198:203-6. 15. Jones TA, Perry Rj, Wake MJ. Marsupialization of a large unilateral mandibular dentigerous cyst in a 6-year-old boy: A case report. Dent Update 2003;30:557-61. 16. Takagi S, Koyama S. Guided eruption of an impacted second premolar associated with a dentigerous cyst in the maxillary sinus of a 6-year-old child. J Oral Maxillofac Surg 1998;56:237-9.